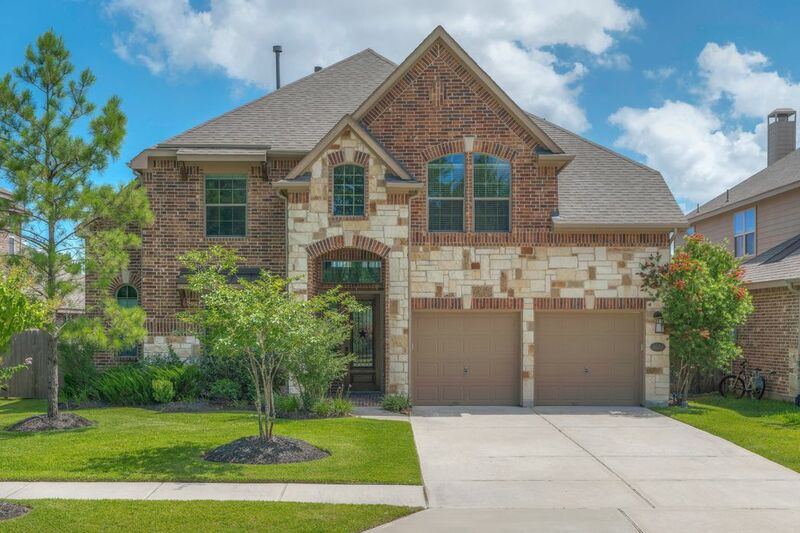 2622 Blue Vervain Drive, Sring, TX 77386 | Martha Turner Sotheby's International Realty, Inc. Welcome to the gated community of Harmony Creek. 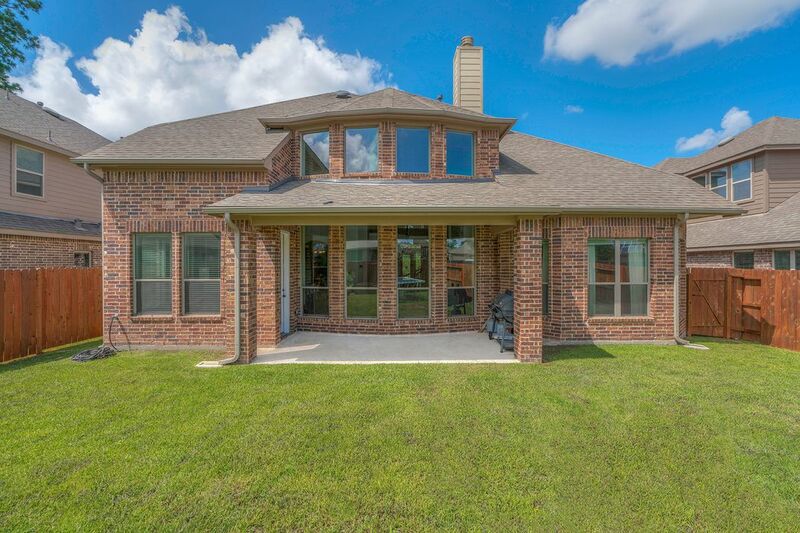 This beautiful stone and brick home is located on a non through street that looks to no neighbors. Looking down over the staircase to the open concept living area. All the floors have been updated to wood throughout the entire first floor. 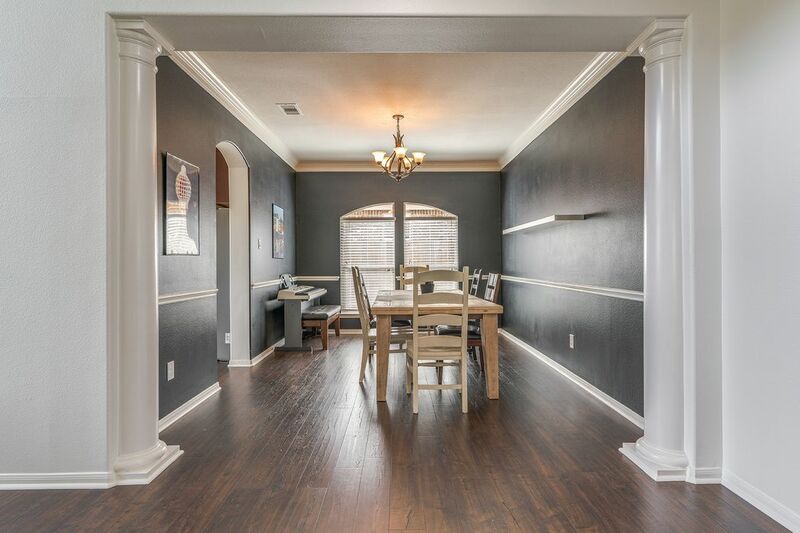 Entry to the dining room accented with decorative columns and custom interior paint. 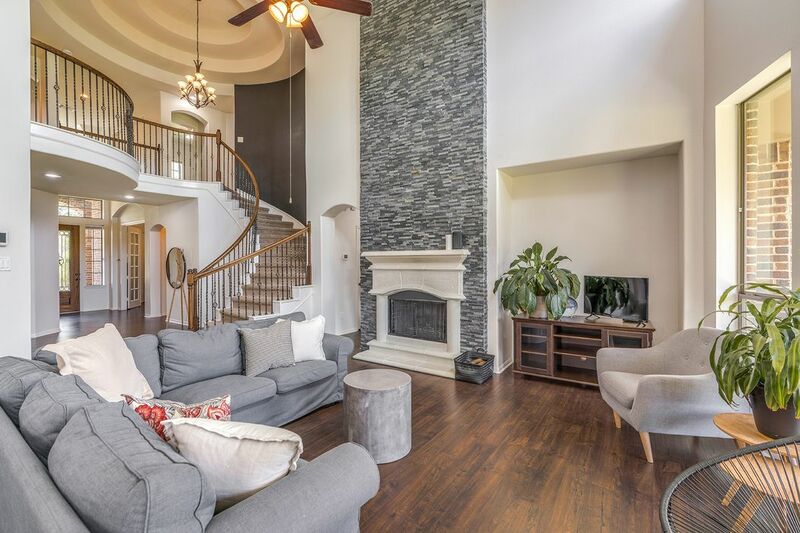 The dramatic tiered rotunda is accented by a decorative painted wall and fireplace that has been updated with floor to ceiling dry stack tile. 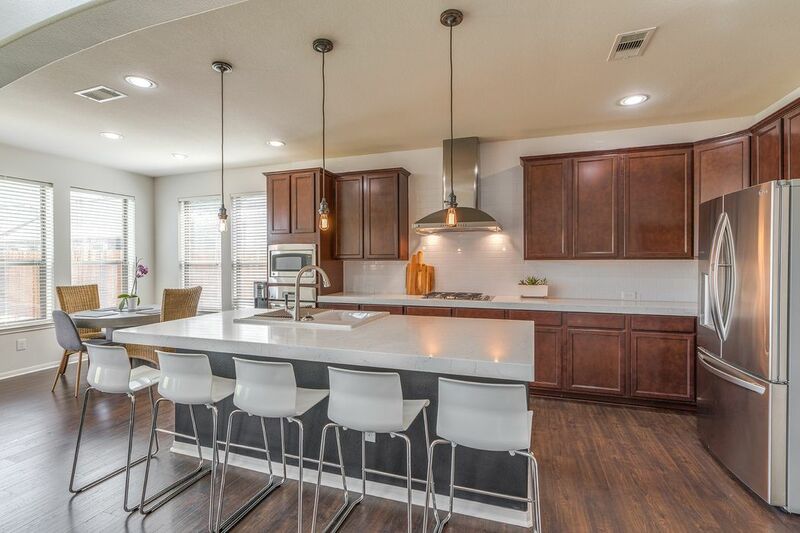 Spacious kitchen with a large eat in island. 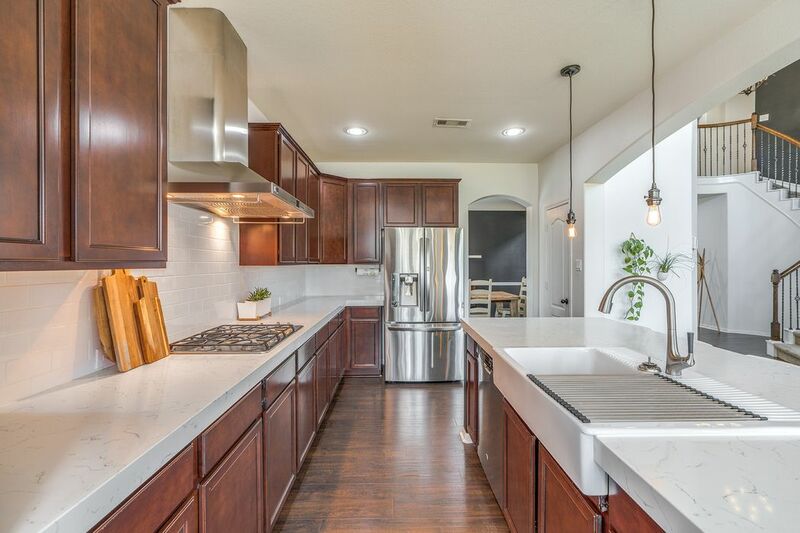 The kitchen has been updated with thick quartz counters, a large porcelain farm sink and decorative pendant lighting. 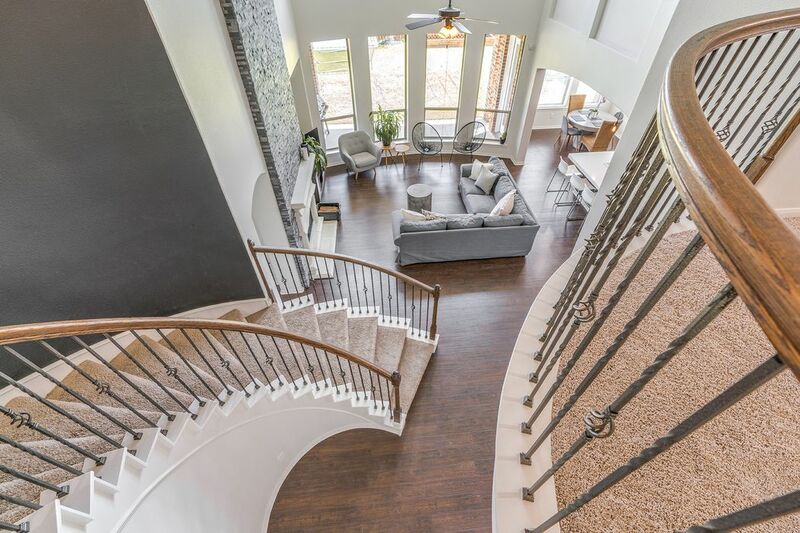 A view of the spacious living area with wrought iron banisters accenting the staircase and upstairs walkway. This is a functional home designed to impress. 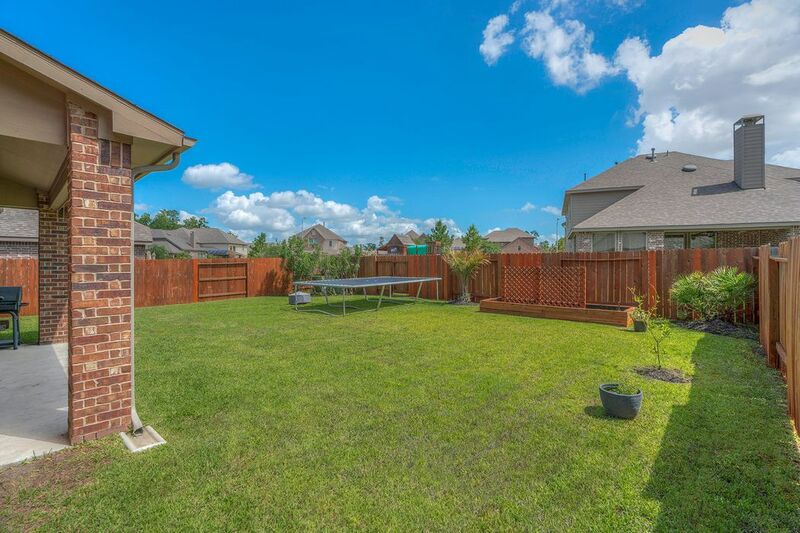 The backyard is completely fenced with a cover back patio. There is definitely enough room to add your own personal pool. Enter you new home through a solid wood door with decorative wrought iron. 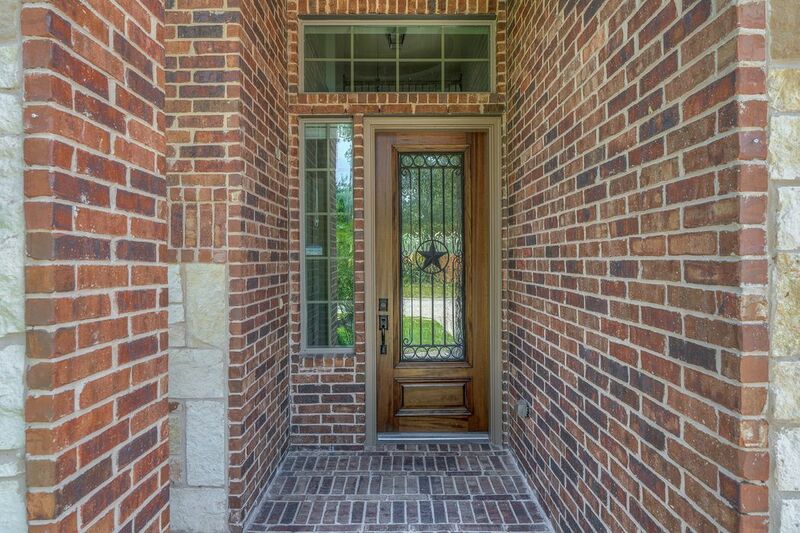 The decorative brick flooring makes your entry very inviting. 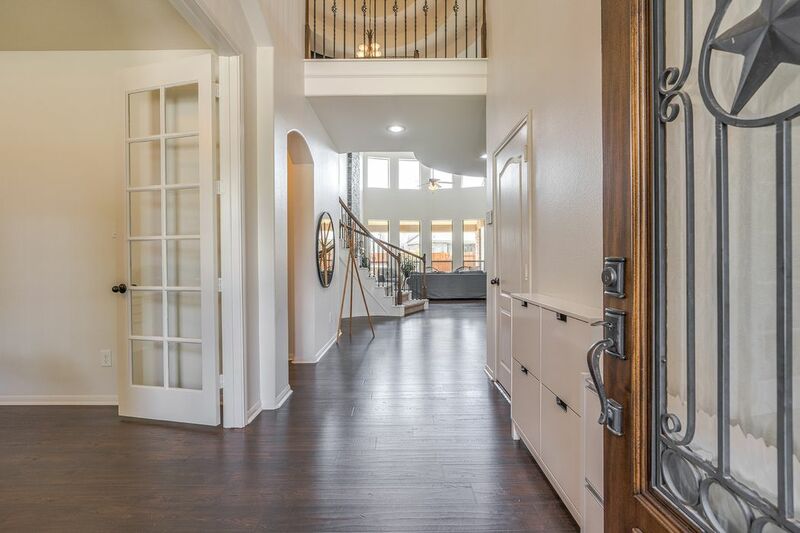 Enter your home to a welcoming two story entry with wood floors throughout. 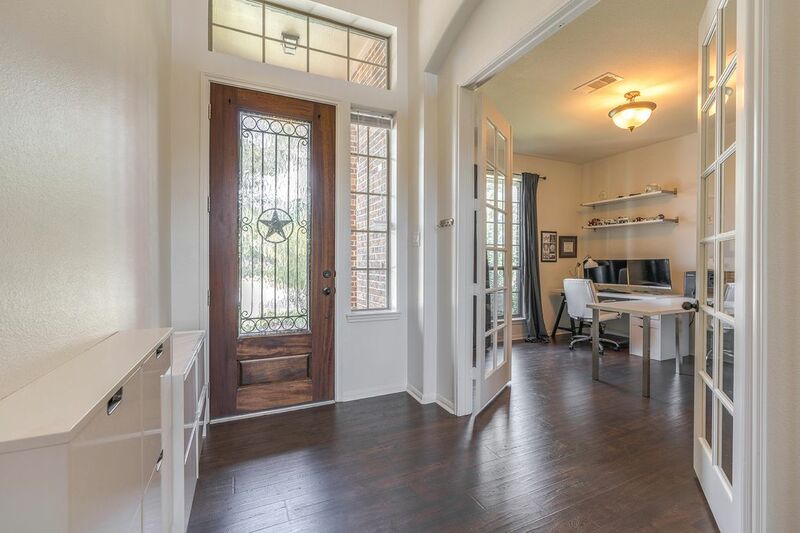 Access to your home office or study through decorative French doors from the front entry of your home. Harmony Creek HOA takes care of your Hi Speed Internet and Alarm Monitoring. 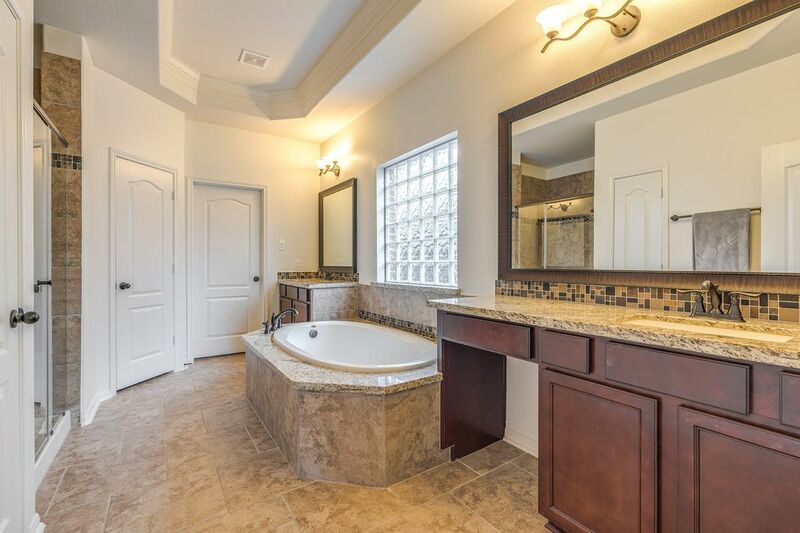 Downstairs half bath with granite counters and decorative back splash and framed mirror. Dining Room with decorative interior paint and fixture. 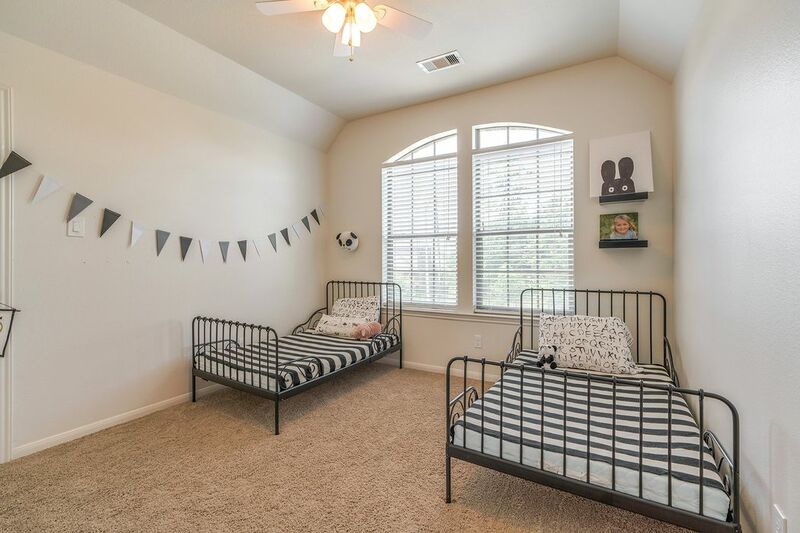 The room is accented with crown molding and trim. Kitchen has been upgraded with a gas stovetop and stainless steel vent hood. It is complemented with a subway tiled back splash that reaches to the ceiling. Lots of storage in the maple glazed cabinetry and preparation space on the quartz counters. Many cabinets have added pull out systems for convenient storage. Breakfast area located directly off the kitchen with wonderful views of the backyard. There is also access to the back patio. 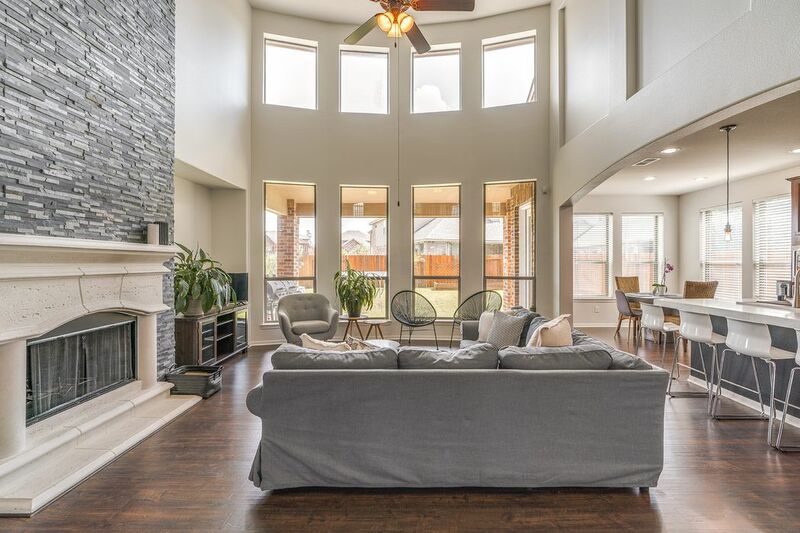 The living area is accented with the cultured Stone gas Fireplace with floor to ceiling decorative tile. The interior of the home has been freshly painted. A wall of windows offers a ton of natural light to your living area. This is an energy efficient home with a full security system. 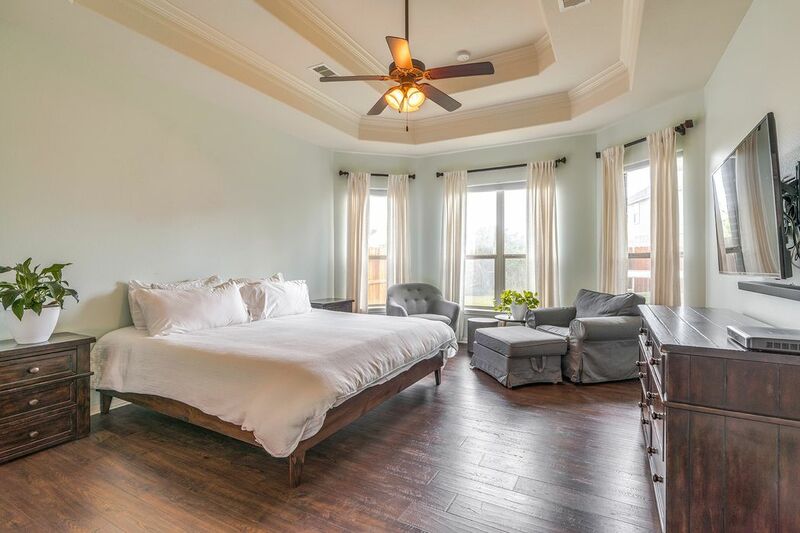 The master bed room is accented with a tiered ceiling and wood floors. The windows look out to the back yard. 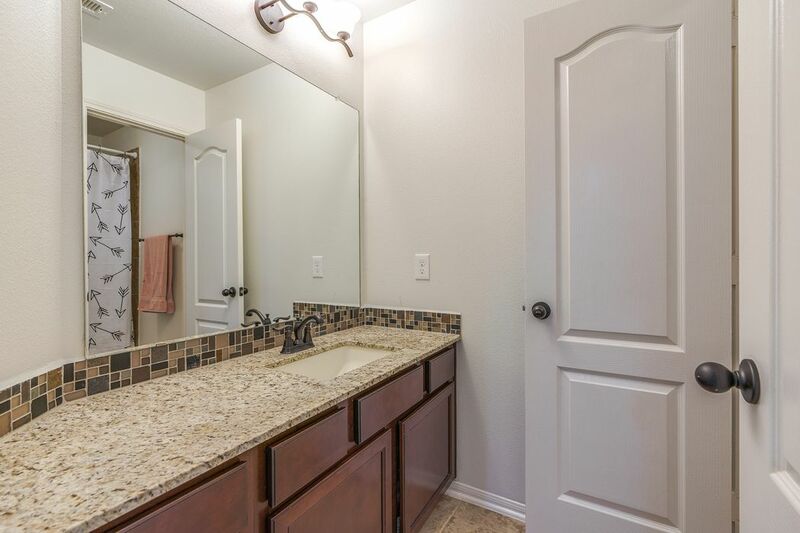 Master bath has separate sink areas both with granite counters, decorative back splash and framed mirrors. 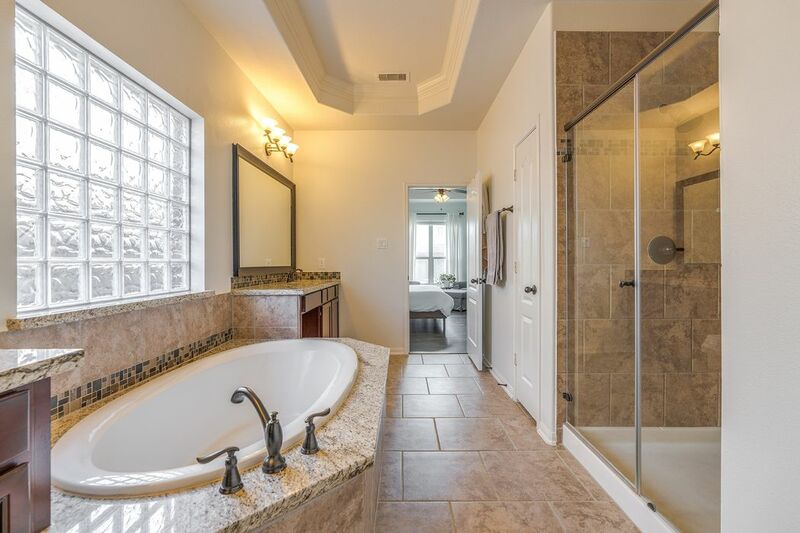 There is a soaking tub and a separate walk in shower. Master closet also conveniently leads to the laundry room. 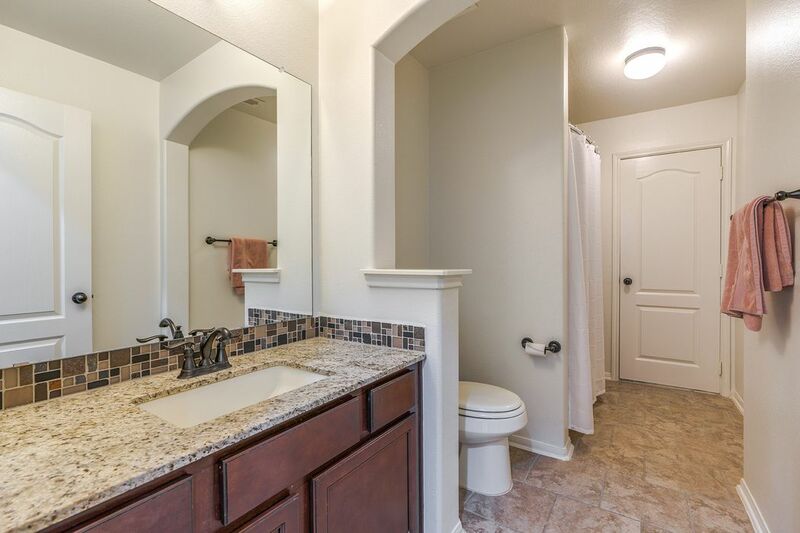 Master Bath with tiled walk in shower. Decorative coffered ceilings and tiled window for privacy. 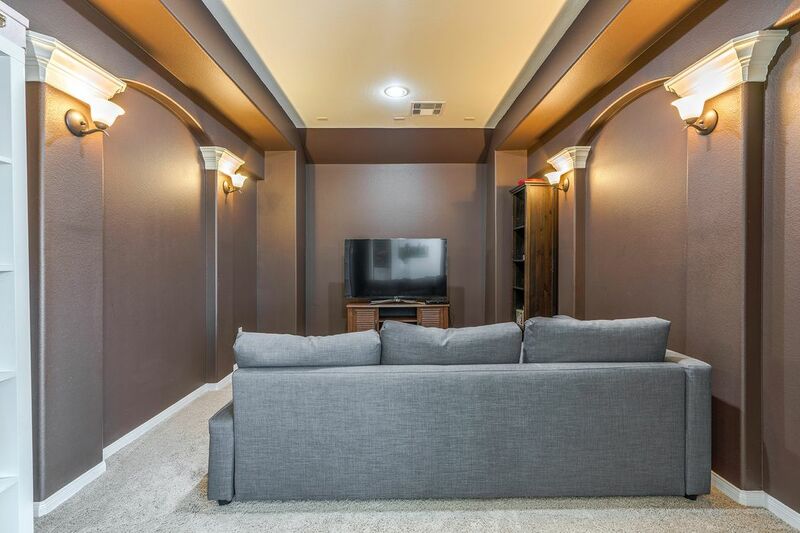 Upstairs game room with coffered ceilings and painted accent wall. 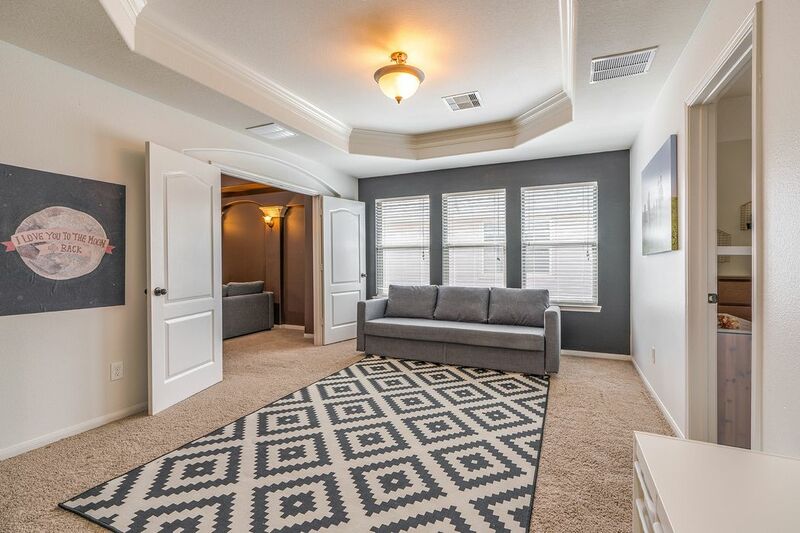 This room leads to the media room. 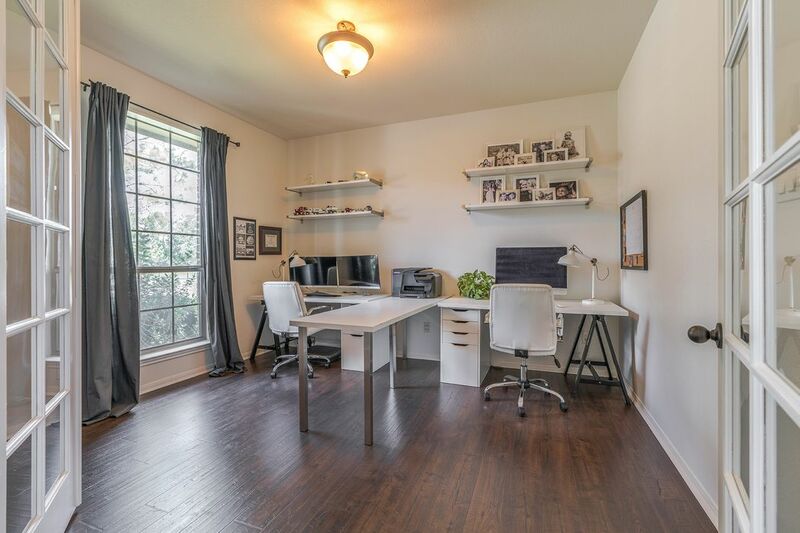 Upstairs media room that is accented with trimmed walls, lighting, and decorative paint. The media room is prewired for surround sound and ready for movie night. Upstairs secondary bedroom with raised ceilings. There is access to additional floored attic storage from this bedroom closet. Upstairs secondary bath with granite counters. 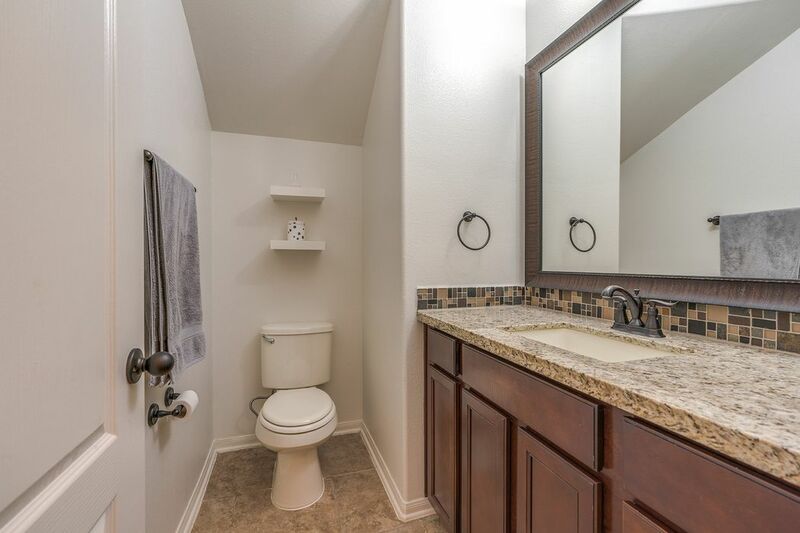 The bathtub and toilet are separate from the sink area. 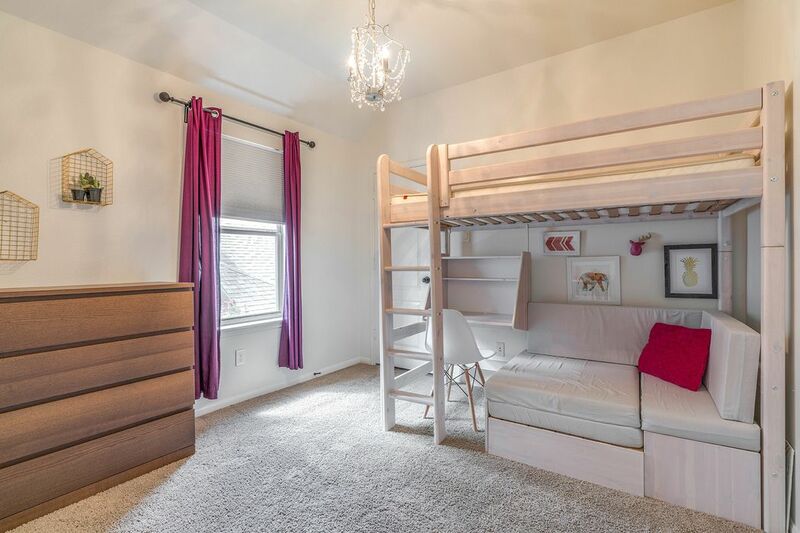 Upstairs secondary bedroom with raised ceilings and walk in closet. 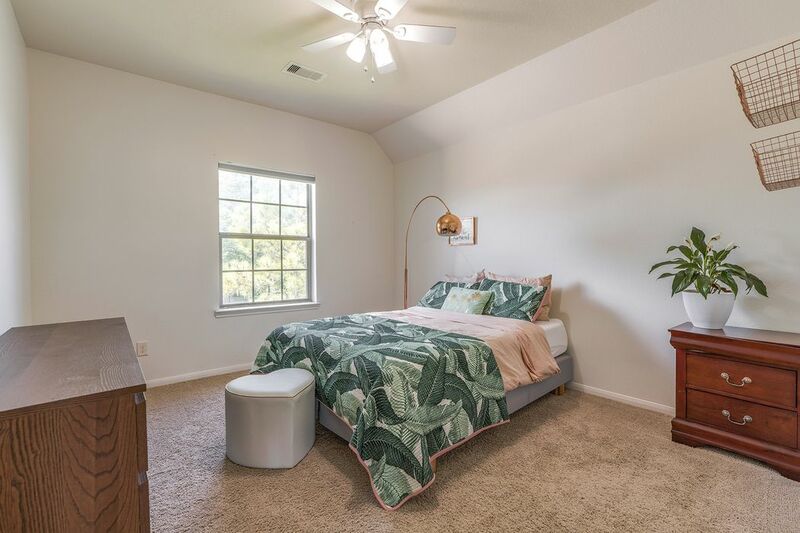 Upstairs secondary bedroom with raised ceiling and ceiling fan. Upstairs secondary tiled bath with granite counters. The back door leads to additional floored attic storage. Spacious fenced backyard. Newly stained. Gutters have been added to the back of the home. There is a raised garden area ready for your tomato plants and herbs. Back exterior elevation view of the home. There is a gate for entry from the front yard. 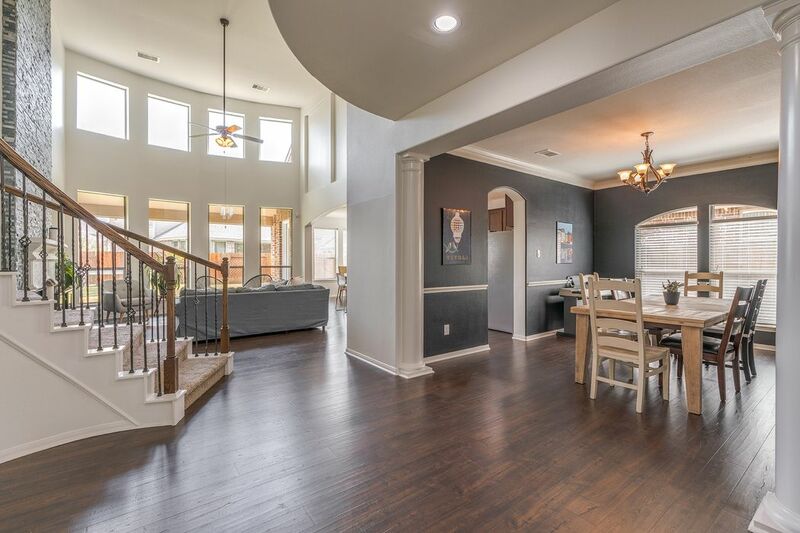 $354,900 4 Bedrooms3 Full / 1 Partial Baths3,434 sq. ft. 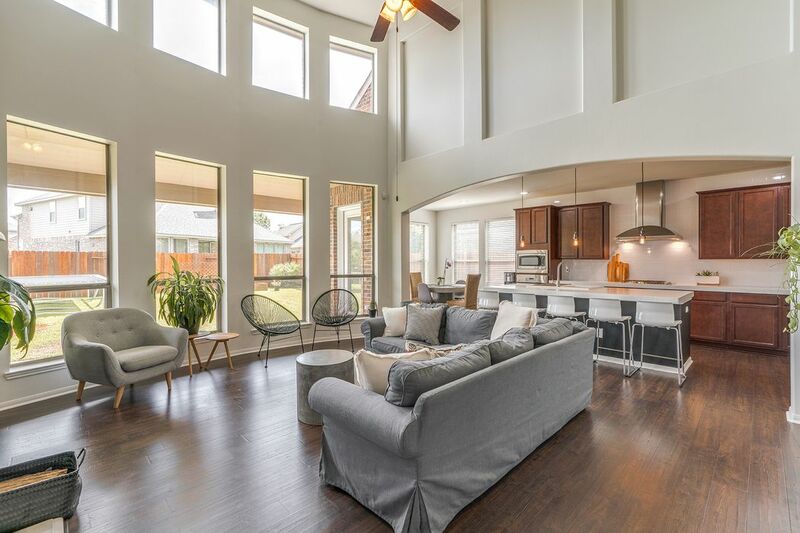 This home is designed to impress and the neighborhood had no flooding during Harvey. 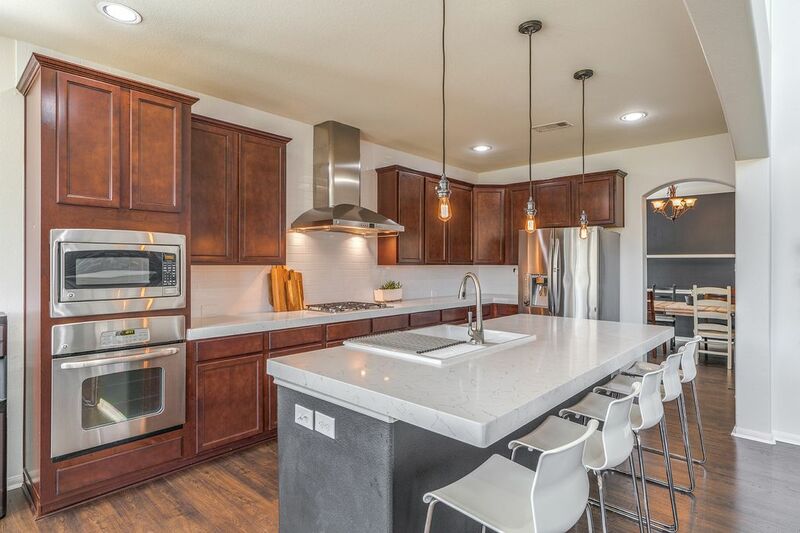 Located in the gated community of Harmony Creek. 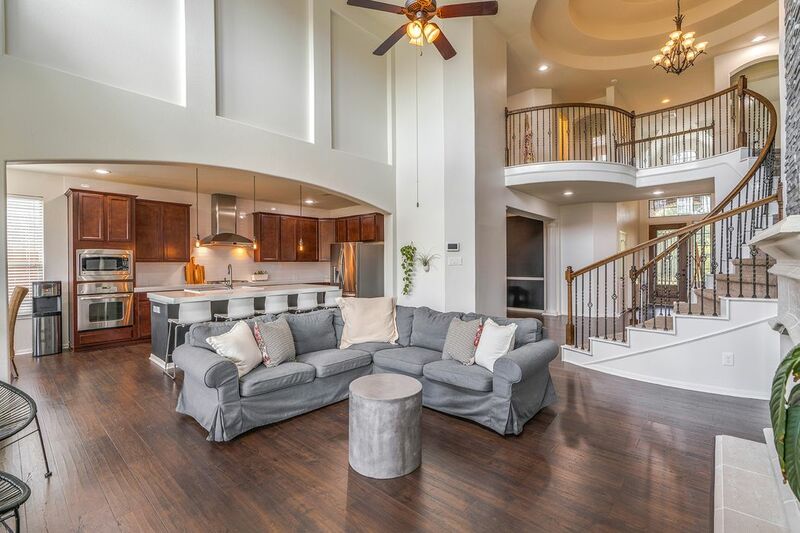 This former model home has a dramatic tiered rotunda stairway, high ceilings in the living area with tons of natural light, floor to ceiling dry stack tile gas fireplace, large open island kitchen with updated quartz counters with an incredible porcelain over sized sink. The kitchen is further accentuated by the tiled to the ceiling back splash and updated gas stove and vent hood. Decorative fixtures finish off the kitchen. The first floor floors have all been updated and the interior freshly painted. 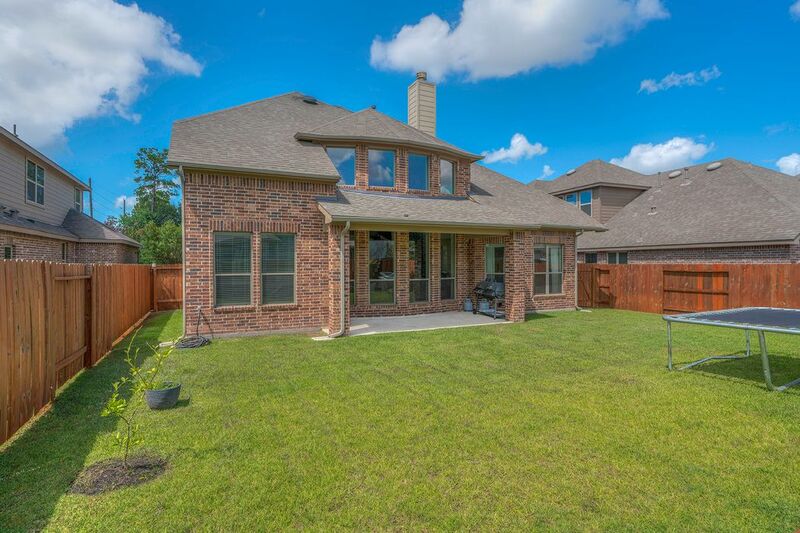 The home has been updated with a full yard sprinkler system and garage door openers. The media room is wired for cinema and there is a full security system. 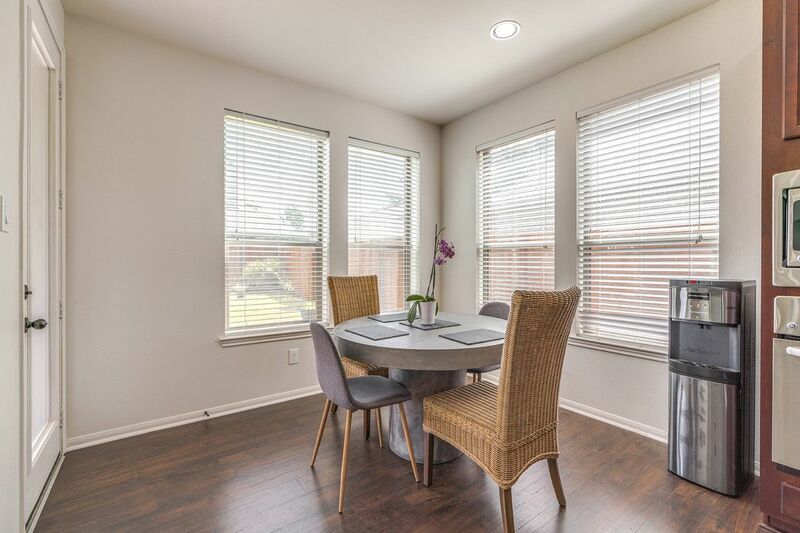 The home is located on a non through street that looks out to no neighbors in the front and close to great schools and the neighborhood amenities.